Yes, we've heard everyone say this for years...eat all your veggies, stay away from junk food and watch those calories. We've proven that good eating habits are vital when you are a cancer patient. Sure, you can push your shopping cart into the not-so-nutrious area of the supermarket once in awhile, but for the most part, pay very close attention to your overall diet. Fruits are a must, but be extra careful with grapefruit or pineapple if you are taking particular medications as they might react to some meds. It is always best to check this out with your doctor first. 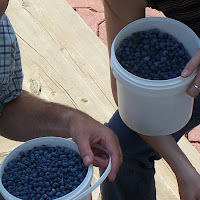 In our area, blueberries are in abundance now and we are fortunate to be able to pick wild ones very close to home. Vegetables are important to maintain a healthy diet as well, and we eat local produce during this time of year when it is readily available and will always substitute the frozen varieties if necessary. Lots of lettuce, cabbage, broccoli and any green veggies are excellent food choices. My husband has always been very disciplined in trying to maintain a healthy weight, even at times when he's not feeling that great to eat a nutritous meal. He's been very fortunate, that his chemo treatments have not caused much nausea and loss of appetite. We know from experience how quickly weight loss can occur when you are feeling ill, so if possible, try your very best to keep up a good appetite. Even home made eggnog has served hubby on several occasions when whole food is not a substitute and he tries to have at least two milkshakes or more every week. We've purchased a juicer and I've discovered that there actually is lots of juice in a carrot...truly amazing! The worse symptom of his taking Sutent, would be occasional stomach pain which for now, is quickly remedied with proper medication. He had to be extremely careful though not to eat unfriendly foods during his third and fourth weeks when he was on the four-week Sutent medication and definitely appreciated the two week hiatus off those pills, to allow his stomach to return to a somewhat normal state. His routine has changed a little now though, so we are awaiting more time on his present chemo to see if there will be any reactions. He's also discovered not to lie down right after eating while on oral chemo, as this will only irritate your discomfort more. Sleeping on two pillows has proven to be a reliable aid as well to bring relief from indigestion. Tums have worked wonders on heartburn nights and the loss of how food used to taste, is a common theme. Of course, we have learned that no two patients are alike when referring to symptoms of chemo. My husband has been very fortunate to not have had any of the more major reactions, but everyone is different. Grey hair has resulted from the Sutent, but that is very minor in the BIG picture of things. His grey hair quickly returned to normal color once he was taken off Sutent for awhile. That was the least of our worries. For those of you who may be just starting your chemo, I would suggest that you read all of the information that you can, learn about the possible symptoms and how to control them if it happens, but remember that you may only have very few of them, if any! Thanks you for sharing all that you and your family have been going through. When my husband-Jeff was diagnosed with 4th stge terminal cancer-I froze in the hospital and did not leave for 2 hours. I was paralyzed. The thoracic surgeon told us that Jeff had three things going for him: faith, hope and good nutrition and I am doing my very best to ensure that all three are always on our menu but its not easy..no its not!. Sometimes I get really really down but my husband has been doing very well and other than lesions on his feet-has troubel walking like he used to and some bowel discomfort, he is doing well on his third Sutent treatment 4 weeks on at 37.5mg and one week off. So far we have seen improvement but I am always scared as to how long that will continue before something blowing up. Thanks for the website..Its wonderful and I would like to stay in touch. Yes, it's recently been on the news about how grapefruit can be dangerous for those taking particular medications. That is a very helpful website you are developing Debbie for all cancer patients.